Known for its natural rock formations and natural impediments jutting out throughout the course, Oak Quarry Golf Club is a combination of the Jensen Quarry and the Jurupa Mountains. 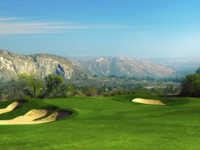 It also is home to one of the best spots for Riverside golf deals in the Inland Empire. It is an 18 hole par 72 that spans a full 7,002 yards and has a slope of 137 as well as a 73.9 rating that is the envy of many courses that offer Riverside tee times. Most players give the course a four star rating out of five total stars, especially when you consider that the course has four sets of tee boxes to challenge each and every golfer who steps up to tee it high and let it fly.